25% to 50% of meetings are described as a waste of time. 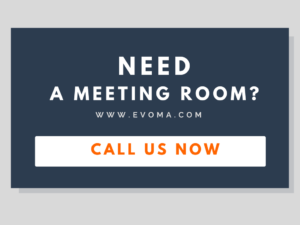 Evoma being a venue for meetings, conference and training sessions, we not only hold our own meetings, but also host a lot of other companies and assist them with their meetings. So I’m going to take a shot at disproving all this evidence about meetings being a waste of time. Just follow these steps below to conduct an effective business meeting. You will find that people who were dozing off during your meetings are now fully awake, paying attention and participating. 1. Hold meetings only when required. Don’t conduct a meeting just because you established a policy of holding meetings once a month. If you don’t have anything significant enough to say or ask, then cancel the meeting. 2. Define a meeting agenda. Your agenda objective should be specific and measurable. The agenda should be distributed to the participants well in advance, to give them enough time to prepare. Keep the focus of the meeting agenda on the most important objective. Do not clutter it with different objectives. For example, you should not club an “operations performance review” with “strategic decision making” – these are distinct goals that need different approaches. Your agenda must list the viable options. A business meeting is typically about deciding or choosing the best option out of the choices available. If there are no real alternatives to present or discuss, the meeting is a waste of time. 3. Invite people relevant to the agenda. Invite only those who are relevant to the issues on the agenda. If the topic under discussion is not relevant to them, and if they don’t have the skill sets to address issues on the agenda, then one of two things will happen. Either they doze off or they talk about things which they don’t know about. Either way, the meeting is doomed. 4. Stick to the agenda. Discussing topics that are not on the agenda is a sure way to derail the meeting. So stick to the agenda. Display it on a screen or board to help keep your meetings participants focused. If someone starts wandering off, gently bring them back to the topic. Unrelated topics can be addressed at the end of the meet, if time permits. But it’s really best to flat-out refuse to discuss matters not on the agenda. 5. Stick to the meeting schedule. Start the meeting on time, and allot a certain timeline against each item on the agenda. End the meeting in time. Any participant making a presentation must be allowed a fair share of the time, and must be reminded to wrap it up quickly after the scheduled time has elapsed. 6: Ban the meeting distractions. Establish a strict policy on calls, email, browsing, texting and other distractions during the course of the meeting. Put up signs if required like “Please turn off cell phones.” Demand the undivided attention of all the participants. That’s one of the key prerequisites for a successful outcome to a business meeting. 7. Agree to implement decisions made in the meeting. Not agreeing on what you agreed on in the meeting is the main reason behind a meeting’s failure. Kicking the can down the road will only cause the same issue to crop up repeatedly in your meeting agendas. The issue remains unresolved, and your meeting continues to be a waste of time. 8. Take the meeting minutes. Assign someone responsible for taking down the meeting minutes. Use a recording device to ensure the accuracy of the minutes. In conclusion, I’m glad we had this business meeting online, on our website. We started out with the unresolved issue of how to conduct effective business meetings. We discussed all the solutions that could be adopted, and we agree that these eight points listed above will help solve the problem. Now let’s get to it and make sure you follow these guidelines when you plan your next meeting.